The tariff announcement comes after a roughly eight-month investigation into intellectual property theft from China. President Donald Trump has issued a presidential memorandum levying as much as $60 billion in new retaliatory tariffs against China in a bid to thwart intellectual property theft in the country. "The word that I want to use is reciprocal," Trump said at a briefing Thursday, March 22. The presidential memo directs the Office of the U.S. Trade Representative and the Treasury Department to enact "what could be" $60 billion in tariffs to offset what the trade representative's office found to be about $48 billion in harm done toward the U.S. via Chinese trade practices. The tariff announcement came after a roughly eight-month investigation into intellectual property theft from China. The issue has long been a concern for U.S.-China trade relations, but this was the first time the Trump administration has directly targeted China with a major trade sanction. Earlier item-specific trade sanctions have applied to numerous countries instead of just one. The trade office will publish a list of products affected by the new China tariffs in 15 days. In 30 days, there will be a window for comment from corporations and from the public. 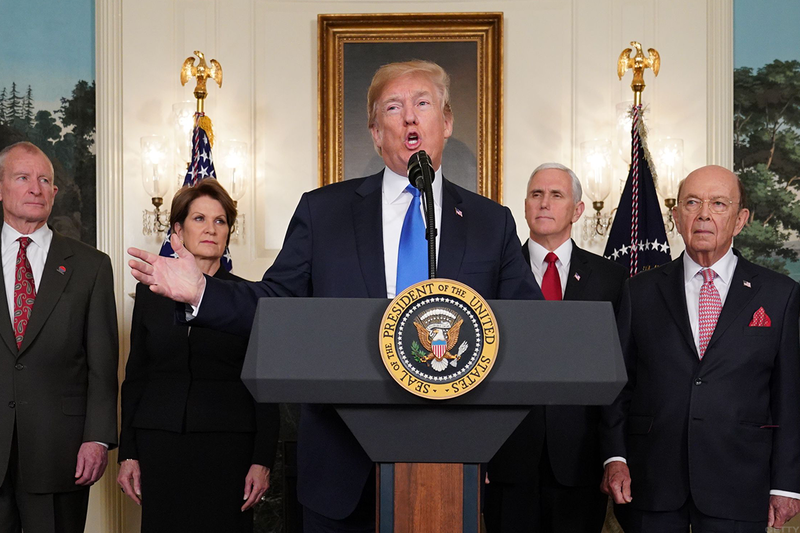 Trump said he has spoken with President Xi Jinxing and with other Chinese representatives regarding the tariffs. "I view [China] as a friend. I have tremendous respect for President Xi. They're helping us a lot in North Korea," Trump said. Trump announces tariffs against China on Thursday. The tariffs are multifaceted: they will both go through the World Trade Organization to claim China engaged in unfair trade practices, and they will be based on the findings of a Section 301 investigation alleging China brought in or subsidized certain products from other countries unfairly. It's the latest in a series of protectionist trade policy moves from the Trump White House. Earlier this month, the president enacted a 25% tariff on steel imports and a 10% tariff on aluminum imports. The size and scope of the new China tariffs had not previously been disclosed before Thursday, but U.S. Trade Representative Robert Lighthizer said at a Capitol Hill hearing on Wednesday that the tariffs will target China's technology industry and possibly limit Chinese investment in the U.S.
Lighthizer said there would be about 10 industries specifically impacted by the tariffs, but they are at their core targeted at punishing China for alleged intellectual property theft. They are expected to specifically target technology sector products for which China has the advantage over the U.S. The prospect of the tariffs earlier this week reignited fears of a trade war. "China will certainly take all necessary measures to resolutely defend its legitimate rights and interests," if the United States imposes the tariffs, the Chinese Ministry of Commerce said in a statement on Thursday. "We will end up negotiating these things rather than fighting over them," said Commerce Secretary Wilbur Ross Thursday at the White House. "We are in the midst of very major, positive negotiations for other countries," Trump noted. He said early in his comments Thursday that his office is, in addition to the China negotiations, examining trade deals with the European Union and Nafta. Following Trump's announcement, U.S. stocks continued their negative run. The Dow Jones Industrial Average had earlier in the session briefly fallen as many as 500 points but came off its lows in early afternoon action. At the same time, the iShares China Large-Cap ETF (FXI - Get Report) fell 2.9%. According to the Office of the Trade Representative, U.S. goods and services trade with China totaled about $648.5 billion in 2016. Exports were $169.8 billion and imports were $478.8 billion. The U.S. goods and services trade deficit with China was $385 billion in 2016.